No matter what the medium is, vivid storytelling and clear communication – including character development, world building, and the creation of structural patterns – remain the hallmark of every successful picture book. 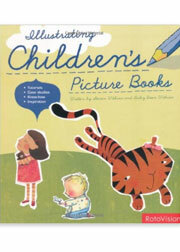 “Illustrating Children’s Picture Books” delves into the world of illustrated books for children of all ages, including infants, preschoolers, tweens, and teens. This fully illustrated book provides an international overview of today’s top children’s illustrators alongside practical, step-by-step instructions on specific creative techniques and design solutions, from traditional drawing, painting, and pen and ink, to digital design and collage. It includes discussions on how to pace content, create emotion, develop a narrative, work with perspective and abstraction, bring a character to life, define an age group, and be culturally specific to an audience.